MaxiCoffee selects green coffees beans directly imported from their plantation of origin where they're grown with care in optimal weather and environmental conditions. In order to offer you impeccable quality beans which meet your expectations, we take care to scrupulously respect our previously established commitments, focused on four issues: origin, quality, packaging and freshness of each green bean. Important: Green coffee should be roasted before using in a bean-to-cup machine or grinder. Otherwise, your machine may be damaged. Rose Diamond green coffee in a 1kg pouch. It comes from the Cerrado region in Brazil, famous for producing high-quality coffees with a unique identity. This Arabica green coffee is tarty and tasty. It has a remarkable presence and is very strong in the middle of the tongue. 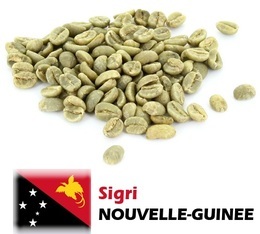 The Frères du Noun green coffee comes from the Frères du Noun plantation in Cameroon. 1 kg bag. This Tarrazu green coffee comes from the Rio Jorco plantation in the Tarrazu region in Costa Rica. Very fruity, this Moka Sidamo green coffee offers a remarkable sweetness and unique taste. You'll undoubtedly appreciate its freshness and purity. This Malabar Moussoné AA green coffee comes from the Karnataka region in India. 1kg bag. This Esperanza green coffee comes from the Esperanza plantation in Colombia. Complex and subtle coffee of exceptional quality. Latest harvest. 1kg bag. This Yrgacheffe green coffee comes from the Yrgacheffe region in Ethiopia. 1 kg bag. This Huehuetenango green coffee comes from the Huehuetenango region, in the North-West of Guatemala, on the Mexican border. 1 kg bag.